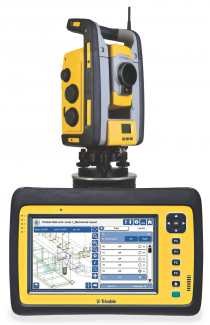 Miron offers tremendous experience in building layout and capturing as-built information for existing facilities through the use of Robotic Total Station (RTS) technology. RTS technology and its associated layout process allows us to monitor building movement and ensures overall quality through a system of checks and balances. This ensures all components of the building are best fit and laid out properly. RTS is an electronic/optical instrument that is used for surveying and construction. It measures both vertical and horizontal angles, as well as the slope distances from the instrument to a particular point. A multitude of data is collected, and calculations are performed. The major benefit of RTS is that it can be controlled remotely by an operator via a remote control. How is RTS Used in Construction? Miron’s RTS and layout specialists use the latest equipment and techniques to ensure buildings are laid out and operating at peak efficiency. Unlike traditional building layout, RTS technology is conducted with a single individual instead of multiple team members. In addition to requiring fewer people, this multi-laser technology is more accurate and efficient, resulting in higher quality building layout, fewer errors, and faster construction. An RTS can also perform more calculations and inspections in less time than a traditional total station.